A University of Wyoming professor has engineered proteins that can be activated by near-infrared light as a way to control biological activities in deep tissues of small mammals. Currently, such proteins will be used as research tools to better understand the biology of diseases and the biology of organismal development, says Mark Gomelsky, a professor in the UW Department of Molecular Biology. With advances in cell engineering, he expects these proteins to aid in fighting cancer, heart disease and other illnesses. “Near-infrared light penetrates through the tissues of animals and humans to the depth of several centimeters. We’re designing proteins whose activities will respond to such light,” Gomelsky says. “Mammalian cells that are genetically engineered to make such proteins can be controlled by light even in deep animal tissues. We want to design a tool set of light-activated proteins with different capabilities to enable researchers to control diverse biological processes. That is because light acts specifically and activates only its engineered target without interfering with mammalian physiology, making it nontoxic, Gomelsky says. Light also offers spatial and temporal precision that no chemical can achieve. 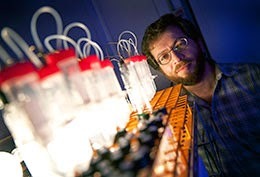 Gomelsky is a senior writer of a paper, titled “Engineering Adenylate Cyclases Regulated by Near-Infrared Window Light,” that appeared in the June 30 Early Edition of the Proceedings of the National Academy of Sciences (PNAS). The journal is one of the world's most prestigious multidisciplinary scientific serials, with coverage spanning the biological, physical and social sciences. This is the second time Gomelsky’s research has been published in PNAS. “This study is a proof of principle that we can engineer near-infrared, light-activated proteins,” he says. Gomelsky’s research team constructed a near-infrared, light-activated adenylate cyclases, an enzyme that regulates various processes in mammals from sleep and memory to heart rhythms and tumor cell proliferation. In previous research, Gomelsky characterized a blue-light activated adenylyl cyclase, which has since been used to study signaling processes in flies and roundworms. 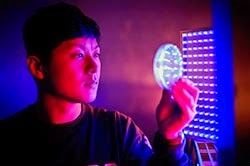 Because of the superior properties of the near-infrared light, the engineered near-infrared version can be used in mice and rats, animal models that are much more informative for human biology. Blue light, like most other light in the visible spectrum, penetrates through mammalian tissue very poorly. This contrasts with red light and, especially, light at the border with near-infrared. To demonstrate the effectiveness of red light, Gomelsky pressed a laser pointer against his thumb. Red light made interior tissue easily visible. When he used a blue laser pointer, interior tissue was not visible. To test how their engineered protein works in animals, Gomelsky collaborated with two University of Pennsylvania researchers who placed the proteins in the neurons that control body movements of roundworms. When researchers exposed the worms to red light, the animals increased their body-bending frequency, as was expected. When researchers turned the light off, the worms quickly returned to normal movements. When invited to speculate about potential future applications of the near-infrared proteins, Gomelsky gets excited. Currently, one of the big problems with engineered cells is that they cannot be controlled once they are deployed in a patient, Gomelsky says. So, if some engineered cells misbehave, there is no easy way to correct that. Caspase is the name of one of the proteins that Gomelsky’s laboratory students are trying to make light-responsive. This protein can induce death. A built-in, light-sensitive caspase could allow physicians to kill mischievous engineered cells in the body of a patient if these cells were to wander into wrong tissues. Such proteins also could be made into an anti-cancer weapon. Most of the paper’s other writers are from UW. These include the paper’s lead writer, Min-Hyung Ryu, a recent UW doctoral student in molecular biology, who currently is a postdoctoral fellow in synthetic biology at Massachusetts Institute of Technology; In-Hye Kang, a former UW research assistant in molecular biology; Anna Lyuksyutova, a UW research professor in molecular biology; Jessica Siltberg-Liberies, a former UW bioinformatician who is now an assistant professor at Florida International University; and Tricia Jensen, a recent UW molecular biology graduate admitted to the WWAMI medical education program. Other contributors include David Raizen, an assistant professor of neurology; and Matthew Nelson, a post-doctoral fellow, both from the University of Pennsylvania. The research initially was funded by a pilot grant from the Wyoming IDeA Networks for Biomedical Research Excellence (INBRE), and subsequently supported by a grant from National Institutes of Health. Gomelsky credits Wyoming’s Experimental Program to Stimulate Competitive Research (EPSCoR) from the National Science Foundation and the Wyoming NASA Space Grant Consortium scholarships for supporting Jensen and other undergraduate researchers, Ryan Griesbach and Steve Schoeber, whose contributions are acknowledged in the paper. A patent for the method of engineering near-infrared protein was filed with UW’s Office of Research and Product Development, Gomelsky says. “At this point, our tool has mostly scientific value, but not yet a commercial value,” he says.